Advanced Office provides its Rancho Cucamonga clients with the best value in high-quality copier and printer sales, leasing, and service. 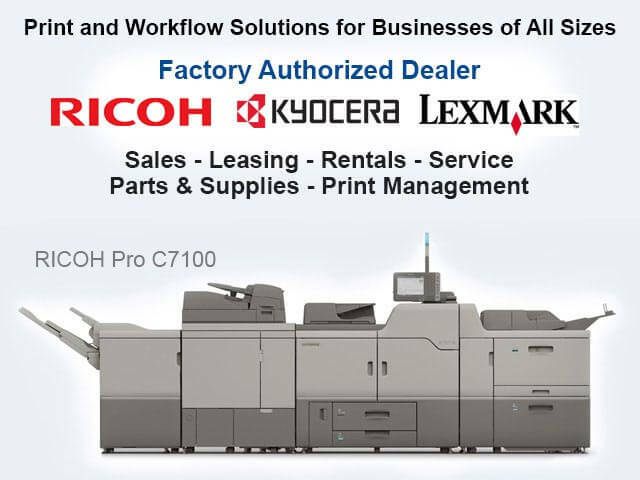 As authorized dealers for Ricoh and Lexmark, we are factory trained and certified to sell, lease, rent, install, and service their commercial copiers, printers, wide-format printers, digital duplicators, production printers, and fax machines. Over the last 30 years, more than 30,000 clients throughout Orange County, Los Angeles, San Diego and the Inland Empire have discovered that they can become more productive and save money on their printing costs by working with Advanced Office. 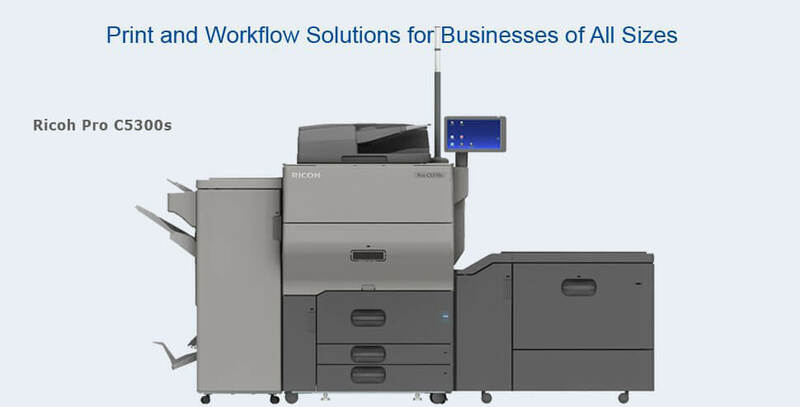 Rancho Cucamonga businesses of all sizes can benefit from Advanced Office's innovative print and workflow solutions. We've helped doctor offices, hospitals, schools, insurance agencies, real estate offices, law firms, and other businesses identify the best office automation equipment for their needs and budget. Everyone on our sales team is trained to provide expert consultations on workflow productivity and honest advice on our products and services. We offer competitive rates and 100% financing on Ricoh and Lexmark's commercial products, as well as custom software solutions and highly cost-effective printer and copier service agreements. New and existing Rancho Cucamonga clients are always welcome to schedule a free workflow analysis with one of our copier and printer specialists. This exceptionally thorough analysis will take place at your Rancho Cucamonga office and be scheduled at a time that is convenient for you. It consists of an evaluation of your current office equipment, your workflow, interviews with key users, and a custom print solution developed for your specific needs. Businesses in Rancho Cucamonga that generate as little as 1,000 prints per month can benefit from our services. Call today to schedule your free workflow analysis. 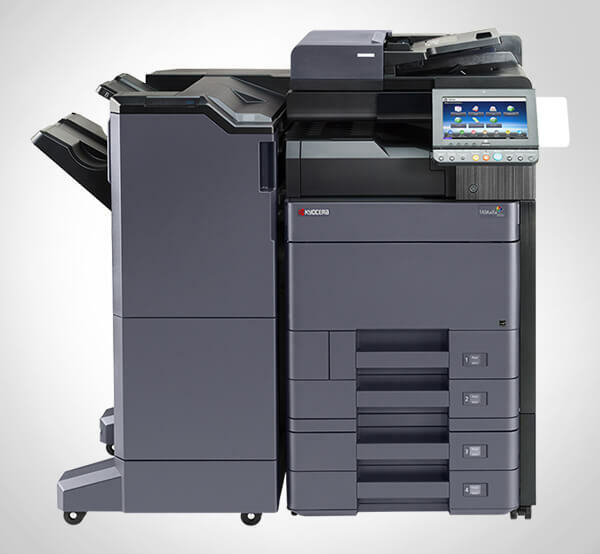 Advanced Office is a leading authorized dealer for Ricoh, whose name has become synonymous with quality and innovation. In fact, Ricoh is a two-time award winner of the Deming Prize for their outstanding commitment to quality. With their dedication to high-performance office automation products and complete suite of standard and advanced security features, Ricoh is now the #1 U.S. market shareholder. Additionally, Ricoh has also been named among "Global 100 Most Sustainable Corporations" and "World's Most Ethical Companies" for their eco-friendly practices. 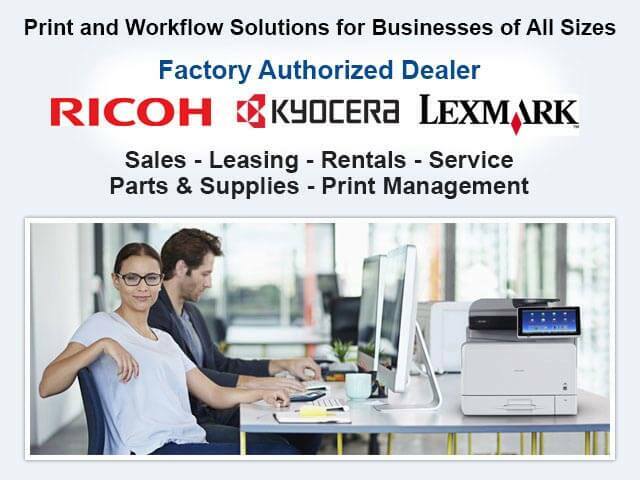 We are experts in and fully authorized to sell, lease, rent, install, and service all Ricoh models, including those by related brands: Lanier, Savin, and Gestetner. By working with Advanced Office, Rancho Cucamonga businesses will receive a level of service that is on par with Ricoh's exceptional quality. By being committed to helping our clients throughout Rancho Cucamonga as well as all of Southern California find the right Ricoh products for their specific needs with superior customer care and extremely responsive service, we have become the leading Ricoh dealer in the Western Region and the 12th ranked dealer in the U.S.. Call today to learn more about Ricoh's products, including their multifunction copiers, printers, production printers, wide-format printers, digital duplicators, and fax machines. Lexmark is another leading manufacturer of copiers and printers. Not only are they headquartered in the U.S., but all of their products are also designed and engineered in the U.S. They specialize in developing industry-specific solutions and offering A4 devices with unparalleled speed for the price and footprint. Their copiers and printers are all built with advanced intuitive application-based interfaces, comprehensive security features, and environmentally friendly green modes. It is no wonder that 75% of the world's top banks, retailers, and pharmacies choose Lexmark. At Advanced Office, we've reached Lexmark's highest level of dealership: Authorized Lexmark Business Solutions Dealer. This means that we can offer our Rancho Cucamonga commercial clients the best pricing on Lexmark's printers and multifunction devices as well as provide exclusive access to special inventory and software. Advanced Office provides the best value in high performance printers and multifunction copiers to businesses throughout Rancho Cucamonga. We sell, install, and maintain Ricoh and Lexmark printers, copiers, production printers, digital duplicators, wide-format systems, and fax machines at highly competitive prices. We also have certified refurbished copiers and MFPs. If you are in the market for a copier or printer, call and speak with one of our sales consultants. They will provide you with honest, expert advice to help you determine the best machine(s) for your needs, budget, and level of usage. Our sales consultants average more than 15 years of experience and understand how critical a printer or copier can be to a business's bottom line. Many of our clients prefer to our copier and printer leasing options because we offer 100% financing, competitive rates, unparalleled service, and the best copiers and printers on the market. Plus, leasing can have a number of tax advantages. We lease Ricoh and Lexmark printers, multifunction copiers, digital duplicators, fax machines, production printers, and wide-format printers. As part of your leasing contract, you can also incorporate custom software and one of our service agreement options. Call us today to learn more. Rancho Cucamonga businesses can speak with an in-house lease advisor about their leasing options and schedule a free workflow analysis with one of our sales consultants. Businesses in Rancho Cucamonga that need a short- or long-term multifunction copier/printer rental come to Advanced Office. We've rented Ricoh and Lexmark multifunction copiers, printers, and other professional office devices to thousands of clients throughout San Diego County at very affordable rates. Our office equipment can be rented for as little as one day or for periods of up to two years. This option has proved particularly beneficial to new businesses, start-ups, and companies that work on remote sites for relatively short periods of time, such as construction contractors and architects. To find out if renting a printer or copier is right for your Rancho Cucamonga business, call us today to speak with one of our sales consultants. 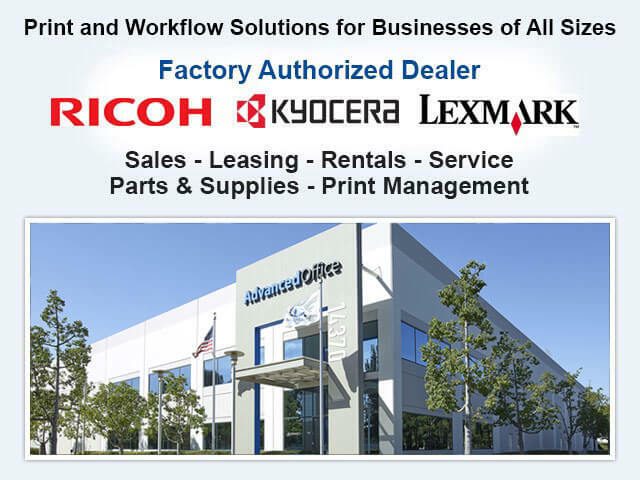 In addition to offering Rancho Cucamonga businesses access to Ricoh and Lexmark's full line of impressive copiers, printers and other office automation equipment, Advanced Office also provides unbeatable industry expertise and exceptional customer service. We have more than 75 highly trained and experienced service technicians, sales consultants, IT specialists, and product trainers throughout our four Southern California offices. Together, they average over 13 years of industry-related experience and have all received extensive factory training. Our team of experts work closely together to deliver the best printer and copier services available in Rancho Cucamonga. We know our customers by name, not number, and are familiar with each of their unique needs. We have a local dispatch and have eliminated all red tape so that we can respond to your needs quickly and efficiently. In fact, we guarantee a four-hour average response time. Additionally, our service technicians excel at first-call effectiveness. They stay current on all Ricoh and Lexmark products and demonstrate the industry's best practices for service, repair and maintenance. They also keep their service vehicles fully stocked with the most commonly used parts and supplies, and have access to our in-house warehouse with more than $1 million in OEM parts. As a result, we are able to deliver, install, repair, and service copiers and printers faster than any of our competitors. We offer all-inclusive service and supply agreements as well as parts and labor agreements to Rancho Cucamonga. These copier and printer service contracts include high-quality parts, our responsive service, access to our IT help desk, and ongoing on-site product training. Call today to learn more. 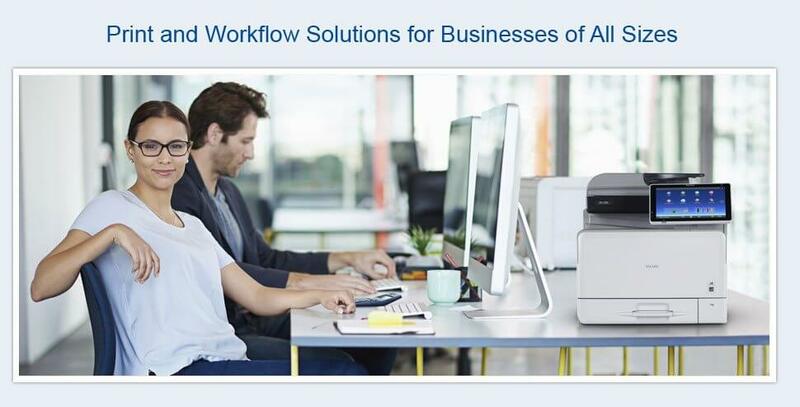 For Rancho Cucamonga businesses looking for the next level of workflow innovation, Advanced Office offers custom software solutions for printers and copiers. Software solutions can include rules-based printing, document management, desktop management, electronic content management, billing solutions, scanning automation, and improved security--all designed to enhance your office's productivity and offer a great return on investment. If you are interested in our software solutions, our consultants can conduct a complete analysis of your workflow and then work with our in-house IT team to design a comprehensive print and software solution to make your business more productive and cost-efficient. Call us today to learn more.